Our standard High pass filters as all our standard RF filter products are derived from previous manufactured designs which have been proven and tested. A high pass filter is somewhat a bit more complex as far as achieving the specification over a very broad band as oppose to it's opposite counterpart the Low pass filter. It will depend largely on the additional parasitic components within and element, such an inductor which have a self resonant frequency due to it's parasitic capacitance, which it's effect will depend on the way it is implemented. 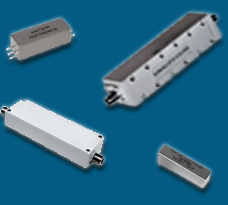 Our standard high pass filters as all of our standard RF filters can be semi-customized, such as shifting the cutoff frequency, changing connectors, and other reasonable modification that are not requiring a new approach or design. Our high pass filters are mostly designed with lumped elements, but distributed elements are regularly used to achieve higher performance, and broader pass band. Some limitations inherited in high pass filters makes designing them difficult, but Anatech Electronics expertise and many years of experience can take the challenge. Our high pass filters are produced and manufactured by Anatech Electronics, and gives us the flexibility to change any electrical parameters, mechanical enclosures, connectors. When the need arise and a modification is necessary full documentation, and a new part number is generated so that filters becomes unique, and repeatable for future need. We can find the High Pass Filter for you!